I've had a streak of bad recipe juju lately; for some reason, a recipe sounds great but the results have been lackluster. 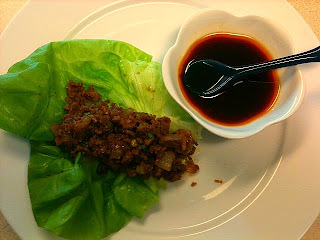 I was a little worried about this recipe for Asian Lettuce Wraps so I put it into the mid-week menu. It turns out this recipe is really, really flavor and will definitely be on our make-again list. I halved this recipe and made one portion of beef (his) and one portion of veggie crumbles (hers); both turned out great. I followed the recipe for the most part but didn't put quite as many water chestnuts in, upped onion/green onion in my portion, and used fresh ginger instead of pickled. I also made the dipping sauce that was listed in some of the recipe comments though it wasn't required but I still enjoyed it. This recipe is highly recommended in either its vegetarian or meatatarian forms. Probably not the weekend menu but it will definitely be a regular menu item!